Photo (c) 2017 Children with Diabetes. Used by permission. Even though my son Carson was diagnosed with type 1 diabetes more than nine years ago, it wasn’t until recently that I heard about the annual Children with Diabetes® Friends for Life® conference in Orlando. When people described it to me, it wasn’t like something they were casually suggesting you go to if you’re in the area or if you have nothing better to do. They acted like it was a totally life-changing event. I couldn’t fathom what exactly made it so special, but I knew I wanted to get my family there to experience it for ourselves. It took some time and saving, but this year the trip finally become a reality for us, and now… I get what they were talking about. 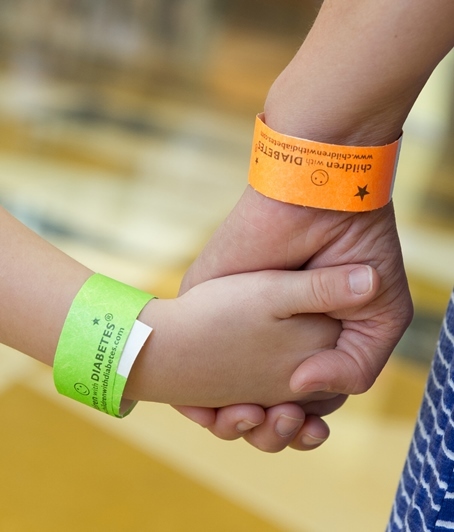 There were dozens of events scheduled throughout the weeklong conference, from focus groups to concerts to Disney World outings, but the magic started right at check-in. If you have type 1 diabetes, you’re given a green wristband. If you love someone with type 1 (but don’t have it yourself), you wear an orange wristband. For Carson, looking around the room and seeing all the people like him with their green wristbands, both children and adults… he thought it was pretty cool. You couldn’t walk down the hallways of the hotel or hop on an elevator without coming across someone who was connected to T1D in some way. In everyday life, I often feel like I spend a lot of time just explaining what diabetes is to people. There was none of that on this trip. Everyone “got it” on some level. Because of that, sending Carson off on his own to the preteen sessions had a much different feel than back at home. There was no having to explain to the leaders what diabetes is or what he might need in the event of a low. We just dropped him off in a room full of other children with type 1 and with a staff that was knowledgeable and capable of taking on whatever diabetes happened to throw their way. I truly did not worry for one second about diabetes while he was away from me. (Neither did another group of moms sitting near me at one of the parents’ sessions; they made plans to grab some girl time at the hotel restaurant and kidded that whoever’s child had the most on-target blood sugar — based on the continuous glucose monitor (CGM) readings sent to their phones — didn’t have to pay for drinks!) That kind of peace of mind is not so easy to come by in our day-to-day lives. We saw the impact it had on our son himself later on at the pool. His father had taken him down to swim one evening while I put his little sister to bed and described the scene to me afterward: Everywhere you looked, you saw children in their swimsuits with their green bracelets, insulin pumps, and CGMs plainly showing. Back home, Carson is the only one with T1D at his school; he’s always had this thing that makes him different. He’s been fortunate enough to make friends with children who accept and embrace this difference, but at the end of the day, I think most children just want to blend in. At the pool, to feel “normal” for once… I know it had to be huge for him. Soon after, when he was due for a CGM site change, he let us put his transmitter on the back of his arm for the first time. This is something he has resisted for years. I can’t describe what it felt like to see him shamelessly sporting it outside his clothes for everyone to see. After years of managing this disease and often struggling under the weight of it, I walked away from Friends for Life feeling… hopeful. After hearing from the expert speakers in many sessions about advancements and emerging technologies, I’m more confident than ever that our children will see a cure for type 1 diabetes in their lifetime, or, at the very least, have access to technologies that will eliminate a lot of the day-to-day burden. In the meantime, we met new friends who are already making our days better. Carson really hit it off with one particular boy, and they exchanged information at the end of the conference. We met the boy’s parents, and his mom and I were still texting even after we had both arrived back home. It’s just crazy how you can meet complete strangers and instantly form this unspoken bond. When your child is diagnosed with type 1 diabetes, you immediately become part of a club you never wanted to join. But going to a real-life meeting of the club, being around hundreds of people who just “get it,” fully and completely, is a powerful, powerful thing.